Peas Pass the Salt Shaker Set Only $21.99! You are here: Home / Great Deals / Peas Pass the Salt Shaker Set Only $21.99! These are the cutest items you’ll have on your spring table! 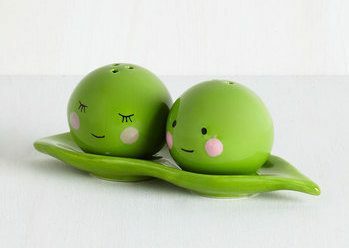 The Peas Pass the Salt Shaker Set for Only $21.99 is so adorable, your guests will be envious! Makes a great hostess, house warming or wedding gift!